2016 started off way hotter than 2015. A sudden jump like this is called a step change. If you expect we'll now cool off to our previous decadal average, forget that. We've "leveled up". The current warming surge amounts to what’s called a step change — a practically instantaneous shift in our planet’s climate. This sudden shift in temperature has arrived because of a confluence of events: Long-term global warming, the multiyear effect of El Niño, and extreme weather — including persistent heat waves at the regional scale. … El Niño can’t explain all or even most of the current warming spike — especially the warmth in the Arctic. El Niño warming probably explains about 0.2 degrees Celsius of the current global surge, according to a modeling study from the Met Office (the U.K.’s national meteorological service). Step changes also happen in other climate issues, such as the rate of sea level rise. Sudden jumps in the rate of melt indicate a tipping point was passed, and new self-reinforcements have kicked in. Our path ahead: major transitional events kicking us into new regimes of change we'll hate. Jet Stream behavior is taking us to an entirely different regime. This is how jet streams have been visualized. In the above diagram they're illustrated as orange-colored tubes. Jet streams traditionally formed rings centered on the North Pole. In the southern hemisphere, meanwhile, the jet stream tends to be weakened by a smaller temperature contrast created by the greater expanse of flat, even ocean surface, although it can impact the weather in exactly the same way as the northern jet stream does. Beckwith points out that the Jet Streams have changed dramatically, not only becoming wavier and slower in the Northern Hemisphere, but also becoming space-filling in both hemispheres, and often crossing the Equator. I've noticed these changes, checking them daily at earth nullschool, as turbulent eddies proliferate kind of fractally. I've also been astonished by the strengthening of the Southern Hemisphere Jet Streams. Beckwith points out that currently the Southern Jet Streams extend to within about 10 degrees of the Equator. Here's a current screen grab of the Southern Hemisphere from earthnullschool. You can barely see any blue at the edges, where the Equator is. The Southern Jet Stream used to make a ring--like barrier, keeping the cold air over Antarctica. Now often bumps and whorls appear. Here's the north right now. You can see there's less purple, red and pink - the colors of faster wind - than in the South, and even less green. There are so many whirls interrupting the circular flow it's hard to count them. Proliferating whirlpools, turbulent flow, are common now. My observations too are that noticeable changes have occurred in Jet Stream behavior, and I've been surprised to not see scientific papers on the subject in the news. One of the effects of these changes is increasing north-south air exchange, as noted today in the Arctic Sea Ice Forum. As Beckwith notes, this causes atmospheric rivers of moisture to move into the Arctic. This water vapor not only carries heat, it's a greenhouse gas. ...since 1990 there has been a 40% increase in total radiative forcing, that's the warming effect on our climate of all greenhouse gases. Rapidly increasing atmospheric levels of CO2 and other gases have the potential, according to the study to "initiate unpredictable changes in the climate system... leading to severe ecological and economic disruptions." CO2 is at ~403 ppm. Last year Antarctic sea ice dropped significantly, and in 2017 it dropped again. 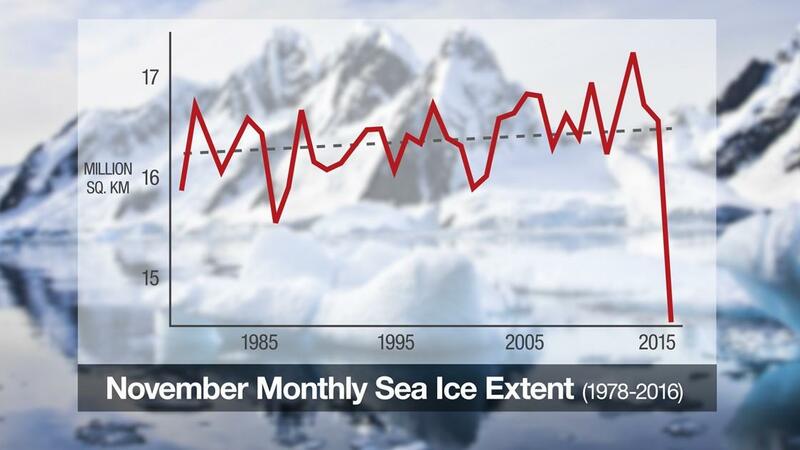 The Antarctic sea ice growth in winter and melt in summer is the biggest annual change on the planet. But the big changes occurring in Antarctica impact not only weather, but the health of the world's oceans too, delivering oxygen and nutrients. During November the sea ice edge is usually around 100km further north of where it is this year. For it to have broken out this early is a significant change and it's causing alarms bells to ring. "It dropped rapidly last year and we're seeing now early break-up of the sea ice. Many of these things coming together certainly don't bode well." 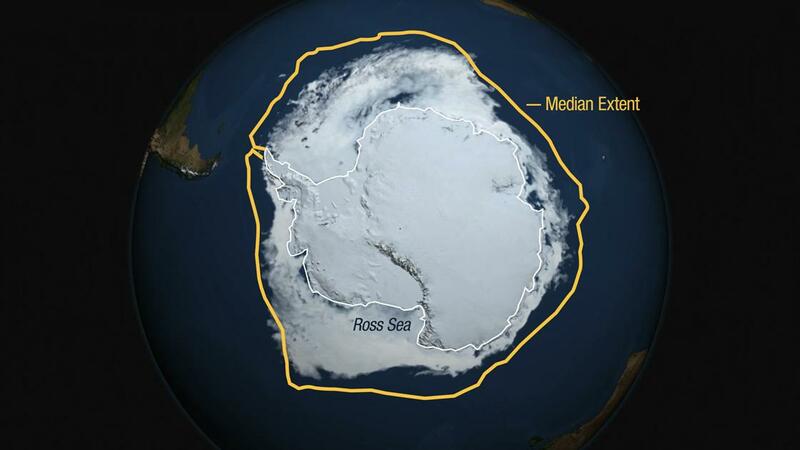 Climate scientists believe Antarctica may have hit a tipping point. "The impacts that we're having on the planet, it wouldn't surprise me if we are going to some sort of step change in how the Antarctic sea ice system operates," Dr Robinson said. Prof Wilson said the abrupt change is "exciting" but troubling. Professor Jem Bendell found a recent step change in climate change, based on data mostly since 2014. See this comment. Researchers discovered that cascading positive feedback loops, likely to be triggered along the rise from 1.5°C to 2°C, will make it much more difficult to stabilize at 2°C than previously thought. Expect an out-of-our-hands rise to 4-5°C. Recall that 4°C rise will be incompatible with organized society. To me it looks as an upcoming step change could trigger a cascade of them, till fossil fuel civilization collapses. ... even if the carbon emission reductions called for in the Paris Agreement are met, there is a risk of Earth entering what the scientists call "Hothouse Earth" conditions. Our study suggests that human-induced global warming of 2°C may trigger other Earth system processes, often called "feedbacks," that can drive further warming -- even if we stop emitting greenhouse gases," says lead author Will Steffen from the Australian National University and Stockholm Resilience Centre. "Avoiding this scenario requires a redirection of human actions from exploitation to stewardship of the Earth system." The authors of the study consider ten natural feedback processes, some of which are "tipping elements" that lead to abrupt change if a critical threshold is crossed. "These tipping elements can potentially act like a row of dominoes. Once one is pushed over, it pushes Earth towards another. It may be very difficult or impossible to stop the whole row of dominoes from tumbling over. "... In particular, we address tipping elements in the planetary machinery that might, once a certain stress level has been passed, one by one change fundamentally, rapidly, and perhaps irreversibly. This cascade of events may tip the entire Earth system into a new mode of operation." About those cascading positive feedback loops expected to be ratchet up during the rise from 1.5°C to 2°C above preindustrial. Climate scientists consider it urgent NOW because the additional 0.5º C needed to initiate the cascade is guaranteed in coming decades from greenhouse gasses already in our air, even if we stopped emitting CO2 today. Earth has already warmed about 1°C above preindustrial levels. The human-caused rise in CO2 hasn’t yet reached its full warming effect, owing to the considerable lag in its impact on ocean temperatures. There is still another 0.5º Celsius or so of warming to occur over the coming decades based on the current concentration of CO2 (408 parts per mn) in the atmosphere, and far more warming beyond that if CO2 concentrations continue to soar with the business-as-usual burning of fossil fuels. Richard Betts points out that, although the domino cascade of feedbacks will be triggered soon, Earth won't reach hothouse state quickly. Here's a graph from the hot house Earth paper which illustrates our climate trajectory. ... it is becoming apparent that Anthropocene conditions transgress Holocene conditions in several respects. In "Anachronistic Fruits and the Ghosts Who Haunt Them" Connie Barlow writes that "Thirteen thousand years ago, the Age of Great Mammals came crashing to a close in the Western Hemisphere. Lost were the giants, the giant elephant, the mammoths, mastodons, and gomphotheres, that maintained a presence in North America for twenty million years. The native horses, a tall camel, and all but one species of pronghorn, came from a lineage thought to have originated in North America. These large herbivores, As well as the biggest bear, the biggest canid, and several big cats, all depended upon the plant eaters. All these great beasts ”disappeared in a geological instant.” Evidence mounts that newly arrived humans with formidable stone-tipped spears of Clovis design were to blame. Two papers confirmed the "overkill hypothesis" at the end of Pleistocene extinctions, one for Australia and the other for North America. ”The "overkill hypothesis” at the end of the Pleistocene extinctions suggests that "evidence is mounting that newly arrived humans with formidable stone-tipped spears of Clovis design were to blame. This extinction of the massive" that marks the end of the Pleistocene epoch ravaged the megafauna." ~ John Alroy. (June 8, 2001). "A multispecies overkill simulation of the end-Pleistocene megafaunal mass extinction.” Science, 292 pp. 1893-1896. Humans can and have caused extinctions in the past. Even though we do not want to be the cause of such massive changes, especially now, as we risk the mass extinctions of all life as we know it, Homo sapiens face this reality. On the other hand, humans causing the mass extinction of human life forms may be a good thing for the planet. There's a flip side to humanity's out-sized impact, Joan. If we accept our place, and use our power to change the planet constructively, there might still be some hope. Sacks thinks we could store vast amounts of CO2 in soil, if we really engaged everyone in the project.